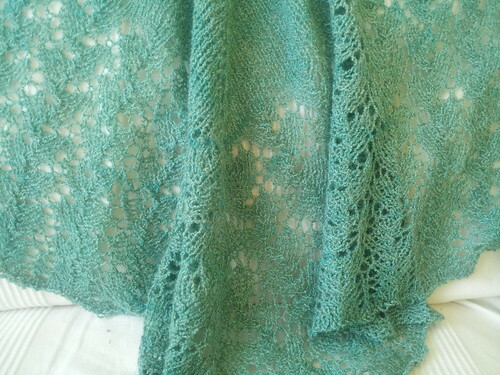 A while ago, Jessica, one of my partners in craft, mentioned that she wanted some drapey, lace-weight yarn in a bright, light green for a summer shawl. I happened to have a bargain cone of bouclé cashmere and silk lace-weight without a purpose so I offered to dye some for Jessica. With unusually poor judgement of pigments I ended up with light teal (colouring was challenging because the yarn was not white to start off with). Luckily Jessica liked the colour and accepted the yarn. I didn’t think any more about it, but I was super-excited to discover when I next saw Jessica that it had been turned into an actual thing. And not just any thing, a beautiful Ishbel, one of my favourite patterns. 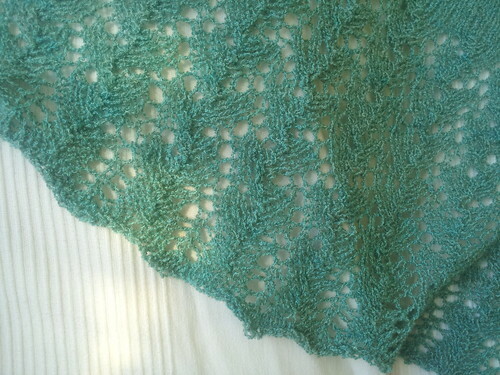 I’m surprised how well the bouclé yarn works with the lace pattern. The finished garment is exceptionally light and warm. I’m already planning my own! Blog Hey, you, get off my cloud! Not having much lace knitting experience I was a little worried half way through that I’d chosen completely the wrong pattern for the boucle, but kept going thining I’d frog it after if need be, as it was good practise for learning how to work a lace pattern. I wasn’t convinced till I gave the shawl a gentle steam press, when it really came to life. It’s lovely and warm round my shoulders when it’s chilly in the evening, and drapes beautifully. Thanks Suz for your part in a truly unique piece!